…This week, my allergies kicked me harder than they have in 2 years, still feeling horrible. Apologies if the following days I’m slower regarding replies etc. …or rather, let me go on a slight tangent: We all know the place, or at least, anyone who has lived in a town of a certain size does: There always is this one bar that, by any rights, should no longer exist. You always see the same failed existences shamble in and out of it and it exudes a palpable aura of desperation, sadness and tears. And if you’re like me, sooner or later when all other bars are closed, you find yourself stumbling into the place, only to regret it almost immediately. That is, unsurprisingly, the type of place Rock bottom is – a tavern where those down on their luck, the lost souls, meet. This notion of decrepitude is further enhanced by several factors – the read-aloud text and details enhance just this type of atmosphere; the barkeep – a war-veteran turned beggar walled off two alley-entries and thus, Rock Bottom was born. While since its inception, the roof has been added and slightly improved, Rock Bottom is still a place where the lowest of the low meet and the prices for the watered beer and soup/stew with tainted meat reflect that, never reaching farther than 6 cp. The war-veteran barkeep and his mentally-challenged half-elven employee are full statted, as is a typical patron. Beyond the less than scrupulous lowlife and small-time criminals, some of which are statted, some patrons actually are agents in disguise, keeping a track on the desperate and destitute and if the set-up does not immediately make you come up with some ideas, you’ll be happy to know that quite a few adventure hooks are provided. The establishment does come with a solid, functional map in color, though I wished we got a player-friendly version sans secret door showing on the map. Editing and formatting are top-notch, I didn’t notice any glitches. Layout adheres to RGG’s printer-friendly two-column full color standard. The pdf has no artwork, but needs none and the pdf comes fully bookmarked for your convenience. The cartography, as mentioned, is okay for the low price. Spike Y Jones is not only a capable editor, this pdf also shows once again his prowess as an author – Rock Bottom is the incarnation of a classic trope and develops it to its logical extreme – if you’re playing a rags to riches story, this is where to begin. If the PCs are victims of a systematic campaign of slandering and deconstruction, this is the low point. 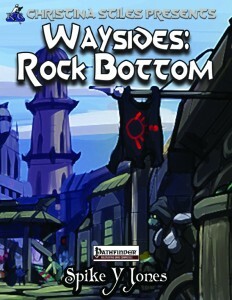 Rock bottom is a window into what it means to be truly poor in a world where the average PC walks around with magic items of the worth of a whole life’s worth of work for a farmer or lowly worker, a look at a facet of fantasy that is not often explored. The wayside reads as a compelling supplement and were it not for the lack of a player-friendly map, it would be truly stellar. As provided, it remains a very good supplement and receives 5 stars, though I omit my seal of approval. 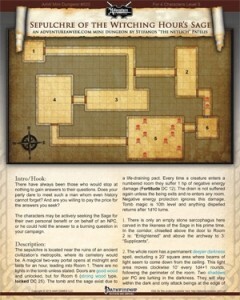 You can get this inexpensive tavern here on OBS and here on d20pfsrd.com’s shop! The other ones are exclusively in this book, though! Ravens are among my favorite birds in real life – their intelligence and aesthetic appeal to me on a basic level. The Clan of the Raven’s members do share the traits associated with their real life brethren – known for an interest in education and the gathering of knowledge, including a pretty shady reputation, perhaps stemming from their uncommon assertion of death being just a station of the migratory lifestyle that is inherent in their culture anyways. Racial-trait wise, members of the raven clan receive +2 Dex and -2 Str, both if they are medium or small. The clans also get +1 natural armor that scales up to +2 at 10th level, a primary natural bite attack at 1d4 (1d3 if small) and are humanoids with the shapechanger and tengu subtypes that also have low-light vision. They may change 1/day into avian form (supernatural ability, btw.) for 1 minute/level as a standard action – for more on that, take a look at my review of Animal Races: Clan of the Raptor; it’s the same mechanic. There are a total of 5 subtypes of clan raven provided: Carrion Crows receive +2 Con, +2 to Cha if you’re undead (cool one!) 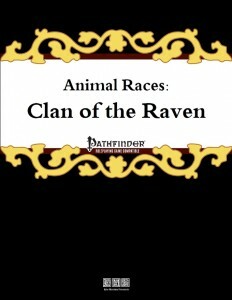 and may take the Raven Clan Heritage feat instead of a revelation from the battle or bones mysteries. Falcon clan members get +2 to Wis and may choose Falcon Clan Heritage as a ranger combat style feat. Members of the Parrot Clan get +2 to Intelligence (non capitalized in the text, a minor, rare typo in the series) and may choose the Parrot Clan Heritage feat whenever they could choose a Perform skill with the bard’s versatile performance class feature instead. Raven Clan members gets +2 to Intelligence and may choose, surprise, raven Clan Heritage as a rogue talent. Finally, Songbird Clan Members get +2 Cha and may choose the Songbird Clan Heritage feat whenever they could choose a Perform skill with the bard’s versatile performance class feature instead. Now, as always, the racial heritage feats can be taken multiple times (with minimum level scaling upwards), providing a selection of additional racial abilities, unlocking more over the levels. The racial traits cover some overlap with the raptors: Primary claw attacks, increased bite damage, +20 fly speed and avid shapechanger, which suffers from the same problem of being available too soon for easy unassisted flight at low levels as in the raptor’s book. True shapechanger, the ability that ends all the limitations on shapechanging can be taken after covering the former. Falcons can choose that one after taking superior flighty, improved bite, claws and avid shapechanger. Having seen trained falcons in action, I was quite surprised to see raptor’s dive (or an in-flight rush variant) not included here – especially since Raven Clan Heritage covers identical traits, but additionally also allows for the scolding ability, which nets you ear-piercing scream 1/day per 2 HD as a cha-based SP. Also, here’s a fun fact – I actually nurtured a semi-wild crow back to health when I was a child and if the their tongues are loosened as chicks (painless and no injury to the bird, btw. ), they actually can learn to talk, so I was a bit surprised to see the voice mimicry trait, which conveys the ability of the infiltrator investigator archetype, not included among the options. Not a complaint, mind you, just an observation. Parrot Clan members can obviously select this one and also may choose avid shapechanger, claws, improved bite and flight, with true shapechanger being the only one unlocked later. I was a bit surprised to not seen an anti-object/sunder upgrade for parrots, to be honest. Songbirds may choose avid shapechanger, superior flight, voice mimicry and also, exclusively, tiny form, with true shapechanger as the only high-level choice. This also points towards an issue – it is evident from the tiny form ability that songbirds are supposed to either always be small or that their bird forms are supposed to be small, when neither is required by the base racial traits. Interaction between the ability and medium songbirds is wonky. Beyond that, we also get 3 additional feats – Gifted Linguist, Swordtrained and Scavenger, providing variants of essentially what otherwise would be covered via racial traits as feats. Not a fan of either – swordtrained unlocks more than proficiencies and both Scavenger and Gifted Linguist feel pretty bland to me – flavorful in concept, but not too interesting. As always in the series, we are introduced to a short section of the genealogy of the raven clans and, once again, a beautifully-written section on interaction with existing monsters and creatures anchors the clans in a fantasy world’s mythology. The deity provided herein would be Morringa, a participant of the wild hunt and a martially-inclined death goddess. The heraldry-traits provided once again can be considered interesting in that yes, the option to receive Gifted Linguist via them feels okay, though I do not understand why the racial traits have been made feats – in the long run, that’s only gonna cause confusion. Other than that, I have no issue with the heraldry traits and enjoy them. Ravens and their ilk being known to have some knack for hoarding shiny things, the appendix of this pdf provides nice dressing tables of random trinkets – 3, to be precise: One for copper, silver and gold, with each entry being worth exactly one of the coins. Nice one! 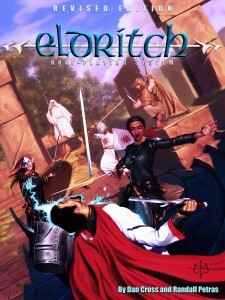 Eric Morton’s raven clan uses the same framework as the installment on raptors, with some minor modifications – this is at once a blessing and a curse – since the raptor-installment was good, this one necessarily isn’t bad either. Internal consistency is also maintained, which is nice indeed. At the same time, though, the execution feels less distinct this time around – the subtypes are not that different when compared to the raptors and the clans could have, quite frankly, used more distinction from one another. The glitch with the songbird clan is annoying and I don’t get the baffling decision to make racial traits that already exist into feats, imho without a significant need to do so. While the fluff is great as always, the content herein does feel less varied than that provided in the raptor clan’s pdf and personally, kind of underwhelmed me in direct comparison. At the same time, I do like several minor tidbits, like Con-bonuses becoming Cha upon turning undead etc. Still, I consider this one slightly less refined and, of course, the issues of low level unassisted flight remain. My final verdict will hence clock in at 3.5 stars, rounded up to 4 for the purpose of this platform. The latest installment of the “Into the Breach”-series clocks in at 34 pages, 1 page front cover, 2 pages editorial, 1 page ToC, 1 page SRD, leaving us with 29 pages of content, so let’s take a look! This review was moved up my queue as a prioritized review at the request of my patreons. As always, we begin this pdf with an array of archetypes, the first of which would be the Academician. These guys get all Knowledge-skills as class skills and Skill Focus for one of their choice at first level instead of Throw Anything. Instead of making regular bombs, academicians can create explosive traps they can place as standard actions that provokes AoOs – such traps can be triggered either via a timer, proximity or a remote detonation, the former requiring a swift action to be executed while within 10 ft. per class level. If a given trap is not detonated within 10 minutes per class level you have, it harmlessly expires. Perception and Disable Device-checks made to notice/disarm the traps scale at DC 10 + academician class level + Int-modifier. At 1st level, an academician can have one trap placed at a given time, +1 at 5th level and every 5 levels thereafter, with no possibility of overlap in placed squares -i.e., there cannot be more than one bomb per square placed, though splash damage can overlap. Essentially, this takes the immediacy of bombs and replaces it with a potential for more control via planning – including interaction with bomb-related discoveries. Additionally, instead of more mainstream mutagens, the academician receives a kind-of-cheesily named “Insightogen” that can have one of 3 effects: Make a single knowledge skill check at +10 insight bonus that can be made untrained. Gain a discovery for 10 minutes per level for which the academician meets the prerequisites or finally, create an extract, even if he usually does not know it, with the same limited duration. All restrictions of mutagens apply – only one can be active at a given time and the concoction becomes inert if it leaves the alchemist’s possession, etc. However, it should be noted, that these do not qualify as mutagens per RAW, meaning that the academician is locked out of a significant array of options as payment for the wildcard-based flexibility. At 14th level, these alchemists can choose two of aforementioned insightogen-benefits at once and as a capstone, a single activation can trigger 5 placed traps, including contingency-style complex triggers, and no, they do not become inert, allowing for deadly mad bomber hideouts… So, what do we have here? A complex archetype that requires a thoroughly complex rewiring of wording that manages to get it right – while I noticed 2 sentences where some slight rewiring would have made things a tad bit more concise, this archetype is interesting – in both instances, it takes the immediacy of the effects and replaces it with a very flexible alternative that pay for this flexibility by requiring planning. Running into a set-up by an academician is nasty, with their wildcard-discoveries and extracts adding a dash of flexibility, but catching them unaware renders them weaker in de facto adventuring – this archetype demanded playtest and it ended up working rather well. Kudos! The Botanist receives proficiency with thorn bow and bracer and gets +1/2 class level to all Knowledge (nature) and all Profession-checks related to plants, while also gaining +1 to AC and damage versus foes he and his plant companion are flanking or that have been hit by both via ranged attacks. Bombs of botanists are grown from fungi and deal piercing damage instead of fire damage, making them less useful versus supernatural creatures with DR, but at the same time more potent due to no resistance applying. The botanist also receives a so-called Verdant Mutagen, which nets a +2 natural AC-bonus and a slam attack at 1d6 for Medium botanists – I assume, at 1d4 for Small botanists, though that is not explicitly stated. While I get the default assumption for slam attacks, I still would have preferred the book to note that the attack is a primary natural attack. One mental stat incurs a -2 penalty, though it can be freely chosen. Interestingly, this one halves movement rate of the imbibing botanist while in effect; for plant companions, it instead acts as a regular mutagen and yes, it can potentially grant the mindless quality to the plant companion. Speaking of which – beyond the ones introduced in the ARG, this pdf does provide 8 more plant companion options in the appendix. Among these, the companions do have some balance concerns – phlogiston companions can e.g. at 4th level launch 2d6 fire damage rays every 1d4 rounds, which provides, especially at low levels, an efficient infinite source of fire damage I am not comfortable with, though this does even out at higher levels. Another companion adds 1d6 bleed to all melee attacks, which seems a bit much at 4th level. But back to the basic plant companion-rules – once awakened, the creature receives at least a 5 ft. base speed if it had none and an Intelligence of 1. The effective druid level is equal to the class level, with full stacking of companion-granting abilities. This replaces all the poison-related shenanigans and the 2nd level discovery, which does feel a bit like a slightly too good deal – companions are powerful. Now one issue here would be that RAW, companions require Handle Animal to be taught tricks and the alchemist does not have this skill as a class skill – I assume the intention was for the Profession or Knowledge (nature) skill to take that role, but if so, the pdf lost this component at one point. It should also be noted that botanists can pretty freely and easily change plant companions, adding a level of flexibility to the class feature that further emphasizes the power of this archetype. At 10th level, the enhanced verdant mutagens created can be used to further enhance the plants – and yes, this allows for an extraction of healing balms that can heal 3d8+HD, while only inflicting 1d8+HD damage to the plant, losing its potency once the mutagen ceases to work. Disease/poison curing and better thorns/growing thorns constitute further options available for the companion. The healing itself is interesting in that it per se provides more powerful healing than you’d expect to see – the lack of a limit means that, by healing the plant, you can, on average, get a significantly increased healing capacity out of it -with some means of fast healing/regeneration, too much. Additionally, it should be noted that the ability fails to specify what type of action the harvesting of fruit or balm constitutes – and whether a plant can be taught to produce the balm itself etc. Finally, the archetype does sport some minor modifications of the spell-list, with some druid-spells added. The botanist is a strong archetype and imho, the plant companions doe require some retooling in the details. Over all, I do like the concepts evoked here, but as written, both the potentially infinite healing factor and the minor balance-concerns of companions among themselves as well as their flexibility makes me believe that the archetype does get a bit of a sweet deal, in spite of the companion’s limited movement rate, which was almost always magically enhanced in my games. The Humoralist is obviously themed around the now-defunct, but rather captivating theme of the humors, with each associated with an elemental place. This allows the humoralist to brew 3+Int-mod infusions per day, granting access to a given cleric domain, while also providing stacking penalties that grow worse, thus rewarding actively an alteration between the different options provided. The spells granted by the temporary domain access are treated as SP, which is pretty nasty, with one use each available and alchemist level being treated as full-blown cleric level. To offset this powerful option, the humoralist does lose mutagens and decreases bomb-damage progression to +1d6 every 4 levels. An issue here would be that I am not sure which attribute governs the DCs of these SPs – I assume the default, but that does render the archetype slightly more MAD than the base alchemist, which would constitute a further balancing factor I’d consider appropriate. Poison resistance is replaces with scaling saves versus damage incurred from a type of elemental damage associated with the current infusion. 3rd level humoralists may also apply the benefits of more than one infusion, with a scaling save. Failure sickens the humoralist for 2d4 rounds – but does he still get the effects from both infusions? Does the current infusion end upon a failed save? I’m not sure and ultimately, in an ability like this, that’s not good – in any case, one can get a vast slew of extra spells per day out of this archetype, as SPs to boot. Compared to that, non-magic healing at 6th level is nice, though not particularly impressive. The ability also has a slight wording glitch, though not one that impedes the capacity to understand its intent. All in all, an okay archetype in concept that has serious balance issues in the execution. The next archetype would be the Kiln Crafter, who can craft fragile items that would usually be made from wood or steel, but which weigh only half as much as their regular counterparts, substituting Craft (Pottery) for the usual associated skills. In the case of weapons, the items do increase their threat range by 1, though – thankfully non-stacking with keen and similar effects. Ceramic armor provides fire resistance 5 against non-magical fire and DR/bludgeoning equal to the armor bonus of the armor. The low cost here can be considered somewhat problematic, especially at low levels when DR still matters more and is considered to be rare. Having run several rare magic campaigns that utilized different variants of the Armor-as-DR-rules, I’m not sold on the math and its impact on low-level gaming in a traditional default setting here, as much as I like it. At mid-levels, the practical effect of DR mellow out, though. Kiln Crafters also receive Disposable Weapon instead of Throw Anything and may further modify the effects of their ceramic weapons and armor via specific glazes that add spikes or remove the fragile quality. Another ability that lets them make weapons that weep acid and crafting terracotta soldiers complement this archetype. I really love the kiln-crafter’s imagery and flair, but it does not feel like a regular archetype – instead, it feels like it belongs into a savage, bronze age sword and sorcery environment, a specific campaign setting that adheres to other equipment/magic-availability rules and one that has a different array of rules for non-magical crafting, since the mundane crafting of these items takes *LONG. * This is not bad, nor is it per se broken, but it does look light it instead ought to have had a slightly different rules-cosmos to work in than default Pathfinder’s high magic/fantasy. Natural Transmuters can be summed up as anti-magic counter-specialists: They create extractors that can capture targeted spells aimed at them and release them back upon their foes, with multi-target spells being only negated for the natural transmuter. This replaces extracts and its pretty much very odd and very awesome – characters essentially can not only be the bane to spellcasters, they can, theoretically, store up on them before encounters. This renders them flexible, but also potentially a drain on allied resources when stocking up – still, a very interesting playing experience that actually gets drawing etc. right. Beyond this ability, instead of mutagens, they can create liquids that change elements and yes, even light to darkness, and yes, they may command material to form structures. Now granted, while the ability does define the changing of materials and energies regarding size, the application could have imho been clearer – as written, this ability partially hinges upon you being able to imagine that you can actually pour something into darkness or sonic and change it thus into another material. This may sound odd, but the concept as such is sound and in fact firmly rooted in by now debunked ideas on how the world works, so as far as I’m concerned, I can perfectly imagine this working in game, with an alchemist commanding thunderous sound into a weapon or armor. I really liked this one, as it is a simplified take on the concept of transient forms that was a basic principle of real-world alchemy and inclusion of this tradition may make sense and fit in even otherwise rare magic worlds where casters a nigh-unknown/banned. Due to potency being directly correlated to magic frequency and availability, while still having unique tricks to modify energy and matter, this one actually also works well in such contexts. Yes, I actually tried that out and it works in both high-fantasy and rare-magic contexts, though in different ways -while not perfect, it is this component that renders this archetype a little masterpiece in my book. The Pyrotician may draw and light fireworks as a standard action, faster even with Quick Draw/Quick Light, getting the rules-interaction right – and yes, allowing potentially for the set-p of multiple fireworks-attacks. Fireworks utilize splash weapon rules, even though they need to be aimed as a standard action (something APART from pulling and lighting them) and on a direct hit, they inflict an addition Int-mod +1d6 damage in addition to their listed price. Fireworks not aimed at a given area that inflict AoE-damage, deal minimum damage and damage-progression mimics that of bombs. Obviously, this replaces bombs and throwing anything. If the above discrepancy between drawing and firing fireworks was no indicator, 2nd level pyroticians indeed do learn to make the fuses of their fireworks longer, with up to a level of delay being possible. Additionally, the pyrotician may tie multiple fireworks together to prep them for simultaneous ignition – up to 1/2 class level ones, to be precise. 6th level allows for the placing of a bundle as a move action and quicker alchemy creation of fireworks is part of the deal. Over all, the pyrotician is an interesting concept that works pretty well – it manages to take a complex array of rules-interactions and make them pretty feasible. At the same time, the damage-escalation of fireworks as opposed to bombs is a bit higher – however, this also is limited, especially at lower levels, by the sheer cost of fireworks – essentially, they are more expensive and thus, a drain on the character’s resources. Especially at first level, this means that pyroticians will struggle hard to get their tools with their meager funding, whereas, the more money you give the character, the more oomph he’ll have. The latter is a component GMs should certainly be aware of, though – if you do not explicitly take heed regarding the awarding of money, these guys will break your game. The next one would be the Supplementum. Instead of mutagens, these alchemists learn to create enhancers. These can be mixed with alchemical items, extracts, bombs, etc. and only one can be in effect at a given time. The effects of an enhancer last 10 minutes per class level. Alas, the respective entries for the enhancer’s application are not always clear: When applied to alchemical items, for example, one of the applications can “increase a bonus from an alchemical item by 1/2” – while I *know* what’s meant here, I do think this could have been phrased better. While I’m engaging in pedantry, doubling listed durations of items should have a non-instantaneous caveat. The bomb enhancements are broken: Considering all splashed targets direct hits? OUCH. I’d be extremely cautious when allowing these… Methods of application for potions and oils and metamagic added to extracts can be found, though we do not get the information whether the supplementum needs to know the metamagic feats in question. Using enhancers to double one bomb, extract etc. can also be accomplished and while the respective wording remains pretty concise, I could pick apart each component, though in all cases, they can be fixed by a capable GM. The supplementum also allows for poison-combination, but fails to specify which save or if both apply upon being subjected to the combined poison. Speaking of poisons – next up would be the Venom Bomber – these guys deal 1d6 +Int mod “poison damage” – not a big fan of that term here, but at the same time, the mechanics for frequency etc. of the poison works pretty well. 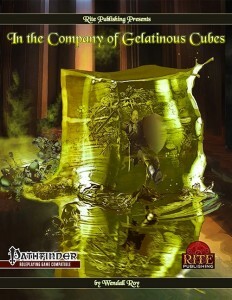 Now you may be aware that a lot of creatures are immune to poisons -well, here the point-based modification of the archetype comes into play – whether oozes or plants and yes, even undead and golems – the right tool’s here and even nonlethal damage, delayed onsets and more consecutive saves required to end it can be found here. Converting venom bomb poison into regular poison can also be achieved (thankfully with a caveat that prevents infinite money from selling poisons) – a well-crafted, cool archetype. Like it! The Viscous Arcanist is interesting – they create tiny oozes that move and follow a specific programming – allowing for a kind of oozy mine-field of strange creatures that can trigger effects – granted, the arcanist, with a slightly expanded spell-list, can also consume the gels, but seriously, oozes are so much cuter! And yes, they have limited lifespans and the same goes for the explosive oozes the viscous arcanist can generate. While here and there, I could nitpick about a minor component of wording not being perfect, the overall concept and execution are pretty awesome – love it! Banechemists would be the first PrC -at 3/4 BAB-progression, 1/2 Fort and Ref-saves, d8, 7(/10th extract-progression and 4+Int skills per level and 1/2 bomb-progression, this one is a combo-PrC for alchemists and rangers, including hunter’s bond and 2 favored enemies. Favored enemy-bonuses are also applied to bomb damage and at every 2v2n level, the PrC receives an adaption that helps synergy between ranger and alchemist components. Partially ignoring resistances, sharing mutagens with companions, increased damage output versus the specific creatures all are nice and the exceedingly powerful capstones are nasty – what about ignoring all resistances and immunities of favored enemies with your bombs, for example? Why plural? Because you can choose which to take. The Exochymist PrC gets 4+Int skills per level, 1/2 BAB-progression, 1/2 Fort and Will-progression, 9 levels of extract-progression, 3 levels of bomb-damage progression and lacks information on which HD it’s supposed to use – a glaring glitch. This one can be considered a theurge between summoner and alchemist, stacking PrC levels for purposes of discovery requirements, bomb uses per day, DC and mutagen-duration as well as for eidolon evolutions. Additionally, eidolons may use mutagens and extracts. The added extracts also mirror this theme, though, like the table, it does show a typo. Eidolons consuming a mutagen can get more evolution points, which can become pretty nasty. The linking and hit point exchange between eidolon and exochymist is also strengthened by the PrC. Per se solid, though the glitches render it more opaque than it should be. The pdf also provides new discoveries and are interesting – using e.g. alchemical ooze companions (yup, also found herein – and the ooze can be swallowed by the alchemist, granting immunity to poisons while it’s in there…) to reanimate corpses is rather…gross, but also awesome. Making some offensive contaminants selected from limited lists and combining bomb-modifying discoveries make for unique tricks, though the latter needs to be handled carefully. Thankfully, it does specify e.g. the effects of multiple damage-type modifications and the like. Curing conditions and granting temporary immunity to them also falls into this range – since some abilities use them as a downside, this could potentially cause a bit of havoc. What about making tiny wasps to deliver poisons instead of making bombs? The latter is awesome, though it ought to specify the wasp’s stats if it’s supposed to be a creature and whether it requires a means to reach the target/whether it requires line of sight/effect -as written, it is implied the wasp executes a melee attack, which obviously means that one could ready a means of shooting it down. Making potions of higher level spells and adding flexibility to poison bombs (not to be confused with venom bombs!) can be found herein -and yes, there are plenty of new tricks here, including ones for the new archetypes. It should be noted that with some of the tricks herein, viscous arcanists may become a bit strong for my tastes. Editing and formatting are good on a formal level. On a rules-level, there are some instances where the wording would have needed a tighter frame. Layout adheres to a 2-column full-color standard with solid, thematically-fitting stock-art. The pdf comes bookmarked for your convenience, though not with nested bookmarks. Frank Gori, Jeff Harris, Taylor Hubbler, Jacob Michaels, Dylan Brooks, Kiel Howell, Richard Litzkow, Mikko Kallio, Mark Nordheim – dear authors, you have probably created the most ambitious Into the Breach-book so far. This one is much, much more complex than the others I’ve read so far – there imho is no cookie-cutter design within these pages and even simple modifications end up being significantly more complex in their interactions than one would assume at first glance. Now this installment is bound to be more divisive than most reviews for the series I’ve written. The positive first: The rules-language herein is pretty precise when tackling even the rather complex concepts that the respective pieces of crunch touch upon. Going literally where no book has gone before, I consider this one of the most interesting archetype-collections I’ve read in a while, with not one archetype falling to the cardinal sin of design – being boring. Instead, just about all options herein are definitely on the high concept side of things both in theme and execution and I love that. At the same time, there are quite a few balance-screws that need a bit of adjustment, quite a few options that can turn out to be problematic. At the same time, though, often exactly said options can end up being utterly evocative, perfect fits for certain groups. I do consider some of the options and combinations thereof problematic and in need of fixing, yes; but at the same time, I found myself really enjoying a lot of the options herein for their respective niches and concepts. In fact, surprisingly, there are concepts herein that go beyond what anything has done before – the natural transmuter, with the odd non-definition of transmutations that is supplemented by just about the right level of details and definition to avoid abuse, can probably be considered to be one of the most interesting archetypes I’ve seen in quite a while. The modular poison-crafting of the venom bomber also should indeed be pointed out as positive and while I will slightly nerf the viscous arcanist, I damn sure will use it in my games. This installment of “Into the Breach” is not the most precise one in the series regarding mechanics. But it *is* the one that inspired me the most. With a plethora of options I will use in certain campaigns, this book has been fun to read. Would I allow it flat-out? No. The Kiln-Crafter imho requires a situative context to work properly; the humoralist is pretty broken and the botanist can use a nerfing; but the frames are solid. You can tinker with these and the results will be awesome and have the potential to be defining components for characters and even potentially the mechanics on how a world works. This pdf may not be perfect, but it does qualify as being inspired, as being innovative. And honestly, I’d rather take that over something perfect, but bland or boring. While ultimately, I *should* rate this down to 3 stars due to its glitches, partially massive balance-concerns etc., I can’t bring myself to doing so, since the devil here, unanimously, is in the details and there alone…and in most cases, you can modify the pieces and turn those nerfing screws yourself. You should consider it a testament to how much I like several of the options herein that I instead will settle on a final verdict of 3.5 stars, rounded up to 4. If you like high-concepts and are willing to tinker with them, go for it. If you want a fire-and-forget “I allow everything herein”-experience, though, I’d advise you to steer clear – the concepts herein require a case-by-case examination for a given group and its conventions, campaign settings and assumptions. 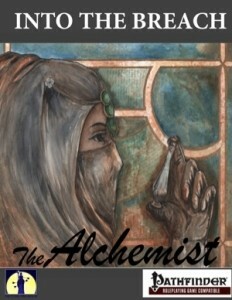 You can get this eclectic collection of unusual alchemist-tricks here on OBS and here on d20pfsrd.com’s shop! This installment of Fat Goblin Games’ Call to Arms-series clocks in at a massive 46 pages, 1 page front cover, 1 page editorial, 1 page introduction, 1 page ToC, 1 page SRD, 1 page advertisement, 1 page back cover, leaving us with 39 pages of content so let’s take a look! Now this book, obviously, expands on the content of the Technology Guide, so I expect familiarity with that material in this review. This supplement begins with a piece of adept prose and recap on the significant influence technology has had on the development of our very society and there is a reason for that: Before we can take a look at how technology works in game, we have to imho consider the implications of the addition of technology – namely why and how it found its way into a given game world. If you are like me and consider the internal consistency of a given game world to be of tantamount importance, you probably have sneered at quite a few explanations for the existence of technology in a given fantasy context – and thus, this book presents us with a plethora of options that explain the rise or prevalence of technology, including rationalizations for the potential of a limited prominence amid cultures. The intriguing component of these basic concepts that range from divine inspiration (see Zobeck’s gear goddess) to the gifts of the precursors, would be that the respective rules by which technology operates in a fantastic context necessarily ought to change – and the results should not be ignored. If technology is, for example, granted by a divine mandate, it should come as no surprise that adversaries of the doctrine will have a more nature-bound, savage mindset – and vice versa. The inclusion of such ideas and adventure hooks renders this section a useful tool for most DMs who do not want to provide a static backdrop for technology that is relegated to a limited area. Now here, things become pretty intriguing, at least to me: One of the basic and utterly jarring components of the basic Kingdom-building rules, even when supplemented by Legendary Games’ superb expansions, would be the absence of a true means of properly advancing your kingdom. Sure, you can improve infrastructure etc., but you won’t be able to create a bastion of enlightened scholars amid the savages, a kind of Neo-Atlantis/Azlant/Ankheshel. Indeed, the kingdom-building rules, by virtue of their origin, assume a medieval backdrop. If your campaign has a different scope, perhaps even spanning the lifetimes of multiple characters, then this will be a full-blown example in awesomeness: What am I talking about? Technology-levels for kingdom-building with concise definitions of which goods and buildings become available, which sciences are taught, etc. And yes, the respective technology tiers do sport rules-relevant benefits for the kingdoms that achieve them and bonuses for researching all technologies. I absolutely adore this chapter since, to me, it completely came out of left field – and yes, there is a huge array of new buildings to create, including android factories and orbital space stations. That’s awesome. i mean, who wouldn’t want to go all JLA on the bad guys? At the same time, there is one tiny component the system imho ought to have covered in a slightly different manner: Tier-advancement. As provided, the guidelines assume essentially a list of prerequisites that must be met regarding buildings and technology, but personally, I would have enjoyed a cost to upgrade once all the prerequisites are met – essentially a conscious push to move into the next age. It should be noted, however, that this very much represents a personal preference and thus does not negatively influence my verdict – plus, one can always include such an obstacle. Okay, after this not only extremely useful, but also surprisingly inspired chapter, we finally move to what I thought this book was all about when I first laid eyes on it: Technological items. Though, once again, this claim just now would be ultimately just as reductive as my previous conception of what this contains. Let me elaborate: The very inclusion of the material plastic with concise stats is pretty much a “Why has no one done this before?” facepalm-moment – and I mean that in the most flattering way: With decreased weight and electricity resistance, plastic is an interesting material indeed. At the same time, though, it does receive vulnerability to fire, which results in a somewhat wonky interaction: Energy damage to objects is usually halved and ignores hardness – so am I correct in the assumption that this halving does not occur for fire damage? It would only make sense, but ultimately, this constitutes a pretty minor issue. Beyond plastics, there is a further component that has galled me about the implementation of technology in most given rules-contexts: The assumption of total functionality vs. being broken – the totality of both conditions is a component, wherein not only the internal game world’s consistency slightly suffers, but also a crucial deviation from the super-science/pulp/science-fantasy tropes the very rules are supposed to provide for. Ultimately, I can get behind class-specific technology that only works for one type of character the same way I can accept psionics and magic, but once you render this an item-class, this assumption fell away and the exclusivity-clause was removed. Enter this book. 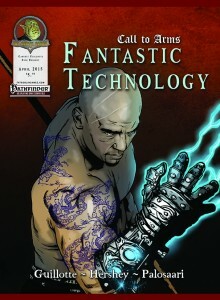 The basic concept is absolutely iconic and genius and perfectly encapsulated in the term “augmentations” – these can be added to a given piece of equipment by characters sporting the Craft Technological Arms and Armor feat akin to how magic works, with a base price of magnitude squared times an amount of gold and magnitude also governing the Craft DC. Now annoyingly, formatting has botched in the bullet point-list that contains these rules – while not rendering the rules opaque in any way, the glitch is so obvious that even casual glimpses should have caught it. But I’ll set that aside to talk about what can be done: From radioactive to monofilament enhancements in different degrees of efficiency, the augmentations are awesome and pretty much represent the fulfillment of my craving for orcs that tack barely understood chainsaws to their axes. And yes, I came to roleplaying games over Warhammer. From graviton hammers to chainsaw swords to plasma-axe muskets, the items herein, some of which receive lavish full-color artworks, uniformly deserve praise on a conceptual level. Interesting here would be that, while there are very minor hiccups here and there, the rules-language, traditionally not exactly the strongest forte of Fat Goblin Games, is up to a pretty high standard and supplements the logical consistency of the items provided – chain-blades, once activated, for example penalize Stealth heavily. When technology becomes more relevant in warfare, it’ll be only a matter of time before espionage and sabotage become a threat – and thus, the new cause for glitches gremlinite should be considered a further and potentially narratively rewarding addition to the glitch-rules. Beyond these, there is a pretty basic and wide-spread trope of certain items with an ingrained personality – whether it’s a quantum processor-powered AI, a ghost in the shell or a HAL 9000 – AIs are inextricably linked to scifi and fantastic technology. Thus, the rules for actually creating AIs is simple – and the sample item “possessed” by this AI is also rather interesting. Now if that were not enough, what about adding a slew of mythic into the fray, providing new legendary item abilities that most certainly will see use by the Genius, Futurist and Stranger paths, should they feature in your game -what about e.g. overclocking beams to make them AoE? Yeah, ouch! What about an absolutely inspired and unwieldy artifact that can make a high-level dungeon indeed rather strategic? New vehicle propulsion options, from combustion engines to fusion? The pdf closes with 4 feats that allow you to create Robots, scavenge parts of technological items for your crafting or make AIs. And there is a feat that lets you unarmed punch empty items to get one final charge out of them – thankfully with a cap to prevent abuse. Editing and formatting are a mixed bag – on the one hand, the rules-language is much more precise than I expected it to be, to the point where actually, I don’t have any proper complaints that would truly detract from this book -so kudos to editor Lucus Palosaari! On the other hand, there are some obviously rushed glitches regarding formatting that annoyed me to no end -though it should be noted, that for most people out there, the amount of glitches will not be within annoyance parameters. The pdf does sport a beautiful 2-column full-color standard with quite a few nice, original full-color pieces. The pdf comes fully bookmarked, though the bookmarks do sport a couple of wonderful names like”h.izabluogbq3a” before providing the proper (and correctly named) bookmarks – so yes, existent, but you should scroll down – and another example of the avoidable glitches that haunt this pdf. When this landed on my pile to review, I was admittedly less than excited – Fat Goblin Games has a track record with me of having interesting concepts (and since John Bennett took the reins as line-developer, an actually great horror setting! ), but issues with the finer rules-interactions. So analyzing a 40+ page book of rules was not exactly my definition of a good time. At this point, I wish to sincerely apologize for this obviously less than flattering preconception. 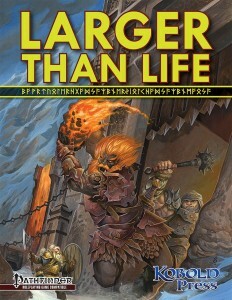 Fat Goblin Games and author Garrett Guillotte have delivered a massive supplemental book that is so much better than I ever anticipated it would be. I expected a somewhat reductive and repetitive accumulation of Technological items herein – what I instead got can be considered the massive appendix for the Technology rules. In some of my previous reviews pertaining subsystems generated by Paizo, I lamented the lack of synergy and further support for systems once established, while at the same time pointing out that this is pretty much where 3pps can take control and deliver. This book makes perfect use of this thesis – not only do we get some material for mythic fans, the kingdom-building component essentially provides the backdrop for campaigns to take a whole new scope: Instead of just focusing on one age or dynasty, one can utilize these to essentially make kingdom-building, Sid Meier’s Civilization-edition. Indeed, a capable GM can just slot more tiers in between for a finer gradient between tiers and expand the concept further, allowing you to potentially tell stories of truly epic scope and breadth. If you’ve been following my reviews for a while, you’ll note that this simple fact is something I value over almost anything else – beyond the mechanics of augmentations, the new items and AI-rules, it is the rules-framework to tell a *NEW* type of story that was previously not supported by a given system that ultimately makes me grin, makes me happy, makes me cherish a product. And sometimes, I get lucky – first Alexander Augunas’ Microsized Adventures, now this book – and two whole new inspiring ideas take form: When combining the two, you could conceivably play characters shrunken to enter an organism and fight diseases with their nanite “subjects” while kingdom-building the immune system. Yes, I’m actually going to run this for my group. What I’m trying to say here is: This book ranks among the few truly inspired crunch book that manage to be innovative. At the same time, I do have a criticism of this book and that ultimately boils down to scope: Whether it’s AIs, augmentations, tiers – I found myself ultimately wishing each of the cool components herein had seen more support and yes, I’d definitely would be very interested in a sequel – the ideas featured herein are so good, I actually would have loved to see them expanded beyond their page-count. 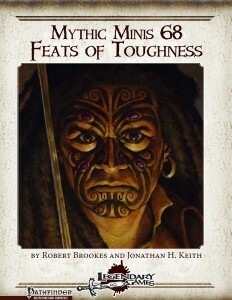 Now for the amount of content provided, this is an inexpensive pdf and I wholeheartedly encourage you all to check this out – I don’t mention books of the superb quality of Microsized Adventures lightly in the context of other books. At the same time, though, the (kind of) professional reviewer has to grit his teeth and point out that this pdf is not perfect; it does have flaws and I wished the glitches I noted weren’t there. If this were either more focused or longer or had no glitches, we’d have a definite candidate for my Top ten of 2015 here. It’s that good. Alas, there are some hiccups in presentation and some concepts that could imho have benefited from more space to render them clearer. So no, I can’t rate this the full 5 stars – I should probably round down. But know what? that would be a disservice to the book and ultimately, you, my readers. This book is inspiring and I always have and always will prefer innovation and inspiration over bland mechanical perfection – and here, this book delivers in spades. hence my final verdict will clock in at 4.5 stars, rounded up to 5, and yes, this book gets my seal of approval – it is simply too much fun, too inspired to be bogged down by the glitches, though the more nitpicky among you should remember that they’re here and probably rather round down.